Ha, I can't memorise this one, so I am taking the note here. Programmers like to leave "TODO" or "FIXME" in comments to remind themselves that there's something unfinished or unsolved. It's not only important for reminding, but also a good way to tell notify the other co-workers: "there's something we need to fix", which is a better way instead of email/IMs. 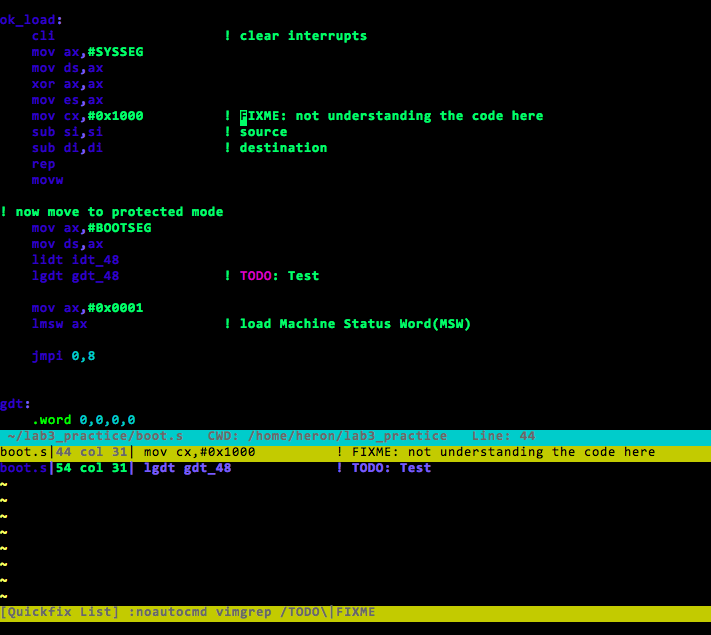 Type ":Todo" in VIM to obtain the list in VIM. In Linux v0.11, the code for booting is written in X86 Assembly Code. It took me a little while understand the code and put some modification on it for the OSDI assignment. In the assignment, we have to add a new bootable section in the floppy disk, and boot into that section. This part is described in the assignment document. Then, we have to enable the user to select which section he/she wants to boot, linux v0.11 or our new section (hello.s). First we print out our custom message by calling "int $0x10", then read the insert key by calling "int $0x16". And, by looking up ASCII table, we check if the inserted code is '1' or '2' to boot the corresponding section. Modified tools/build.sh as below, so that we get our hello.s into the second section. # Changes from 0x20000 to 0x30000 by tigercn to avoid oversized code. Yes, put "hello.s" under boot/. However, the hello.s I am using is not my work but the TA's, so it may not a good idea to put the code here. # load the setup-sectors directly after the bootblock. # Note that 'es' is already set up.